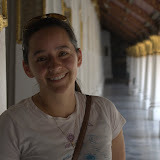 Here are pictures from our trip to the Grand Palace. On Sunday we decided to head here. Mel had been there last year when she visited so we kind of knew were we were going. When we got to the palace wall a Thai guy(haha) stopped us and tried to help us find the entrance. It was funny because he knew English sort of well, but was obviously trying to get us to take a tuk tuk. He told us that the palace was closed and that we should go see all of these other sights that were out of the way and then come back to see the palace. After that we headed to the gate anyways to find that the palace was actually open. We toured through the palace and it was pretty neat, but not really a whole lot to see. After the walk through the palace Mel and I decided we wanted to go check out a market that was a fair bit a way, but we could still walk. After walking a fair bit we realized that getting across this one main road would be pretty impossible without walking straight through the area that the protesters were staying in so decided to turn back. On our way back we found a different market that was full of fairly cool stuff and Mel bought 2 new shirts that are pretty cool. When we got home we decided to head down to the lobby and play a game of Killer Bunnies and see if anybody else down there wanted to play. No luck on getting others to play, but we did finally have a fairly even game finally.